Vítězný návrh z ideové architektonické soutěže UPCYCLE THE BRIDGE na další využití konstrukce starého železničního mostu - Linz Bridge Cinema / Vlad-Andrei Popa + Ioan Ralea-Toma. 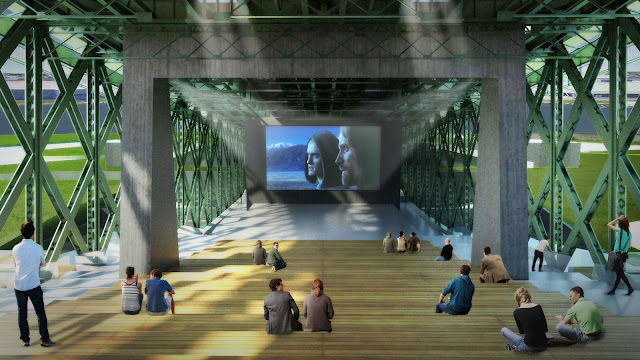 The Linz Bridge Cinema, together with the new harbor development and the old town, define a new cultural axis. 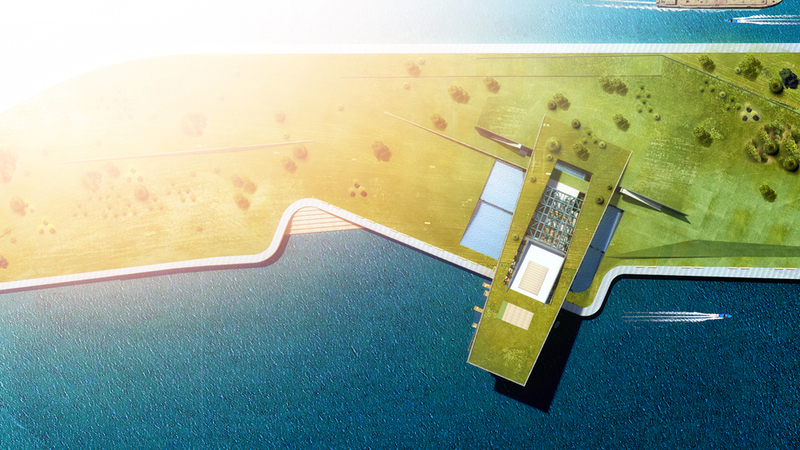 The connecting feature of the bridge is now perceived on a new level. Even though it doesn’t link physical spaces anymore, the bridge still acts as a bond between old and new values, between the urban and the wild, art and nature. Although inverted, the original image of its dominant structure can be seen as a reflection in the Danube or in the water basins created underneath the bridge. 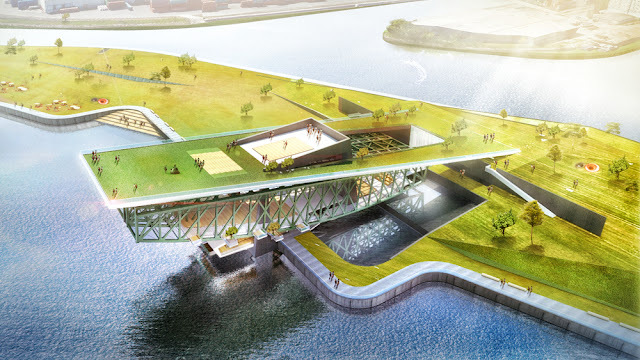 The bridge is being reused as a multifunctional ensemble. 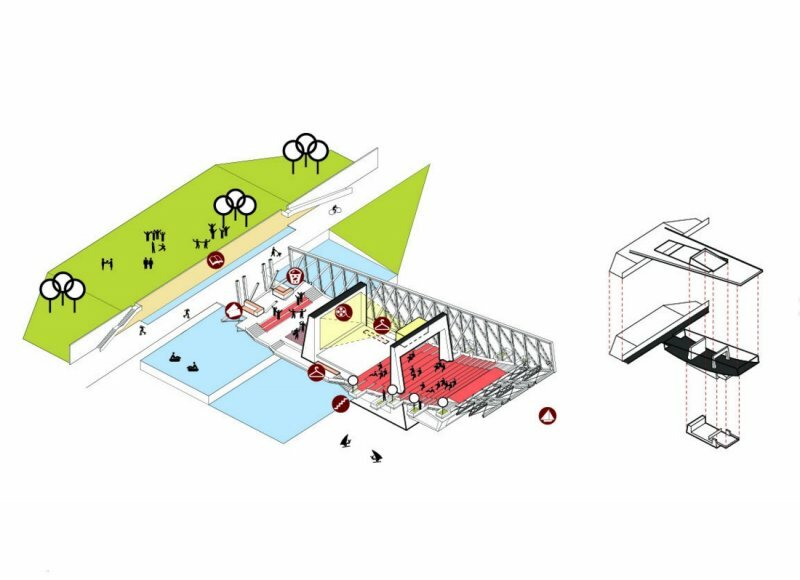 While the main function is that of an Outdoor Cinema, also bringing together a small amphitheater, an interactive mini-cinema, a “history-wall” and a waterfront coffee-house, symbolically named “Under the Bridge”. 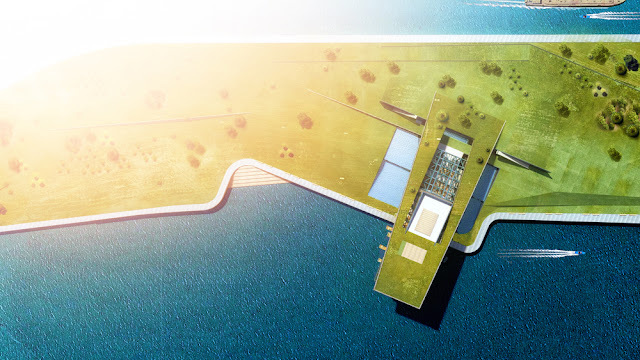 Aside these functions, the rooftop defines itself as an observation deck, as well as natural space, a park where everyone can relax and enjoy the views, prone to draw in activity seekers during winter (ski, sledding). 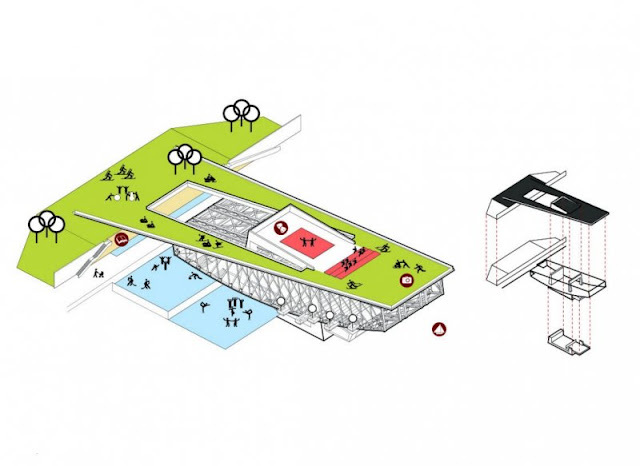 The 3 central segments are being reused in a different manner to create a protective space. While the visual integrity of the Old Bridge is maintained on the outside, the whole structure is being reinforced and suspended over a concrete “box”-the cinema box and screen, creating a floating effect for the passer-by. The trusses that support the pedestrian walkway are being reused in two ways: as a cornice for the side facades, used for illuminating, and as a glass landing linked to the coffeehouse. With a population of 198,000, Linz is the third largest city in Austria. A long-time industrial hub with international importance, the city also plays host to world-renowned events like the ARS Electronica. In 1897 Linz had a railway bridge constructed, which still spans Europe’s second-longest river and one with great significance, the Danube. After close to 120 years, the bridge can no longer accommodate the needs of the city, and is now at the end of its technical life span. In order to further develop the city, together with the public utilities and service provider company LINZ AG, the city of Linz is planning to build a more modern bridge in its place. 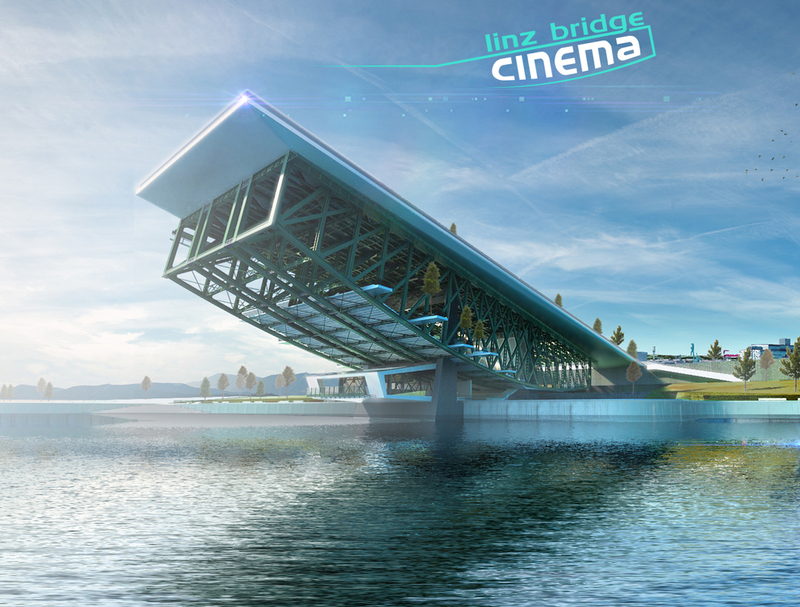 The new bridge concept will ensure that Linz can continue to adapt to the future of transportation as it evolves and will benefit all of the city’s transport users (including pedestrians, cyclists, car drivers, and public transport). The new bridge construction will accelerate the construction for a brand new tram line and bring new development to the city’s east side. 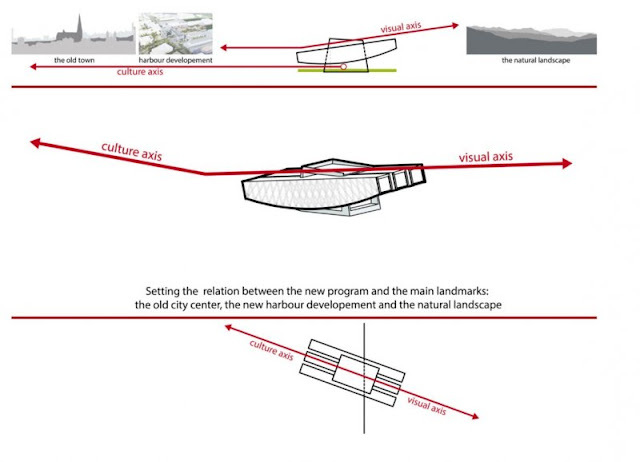 With plans still not final, there has been some opposition in Linz to the building of the new bridge. The alternative to the new bridge plans, would be to preserve the old railway bridge and build an additional bridge running parallel to the old one. On September 27th the people of Linz will decide in a public poll whether a new bridge will replace the old one or a two-bridge solution will be implemented. If the construction of a new bridge is approved, there lies the opportunity to upcycle parts of the old bridge in a public space for the city of Linz. 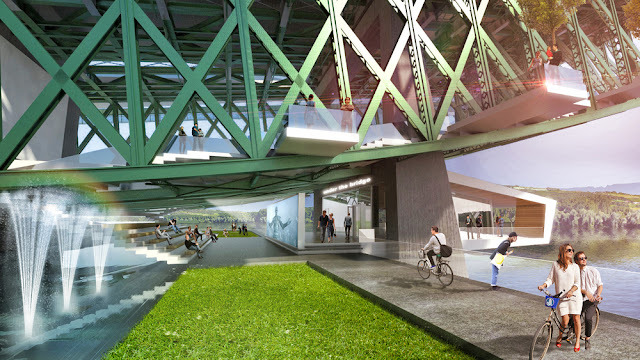 This is a chance for those living in Linz, who are in opposition to the bridge reconstruction project, to remain connected to their old bridge. This public open innovation project is aimed at architects, engineers, designers and artists from Linz, Austria as well as the rest of the world. This is your opportunity to upcycle the bridge in an innovative and creative way, and to present your concept to the public. The aim is to show that an alternative use is not only possible, but also represents a valuable gain for the city of Linz. As a leading online platform for public creative contests, jovoto is delighted to support this process and welcomes the people of Linz to a project with new inspiration and constructive discussions.